It gives every unfinished order a second chance! It happens to the best of us: we’re in the middle of online shopping, have items in our cart but walk away just before clicking “Confirm Purchase.” Whether it’s because of indecision, interruptions or other reasons, it happens all the time – and all too often those shoppers never return to complete their purchase. 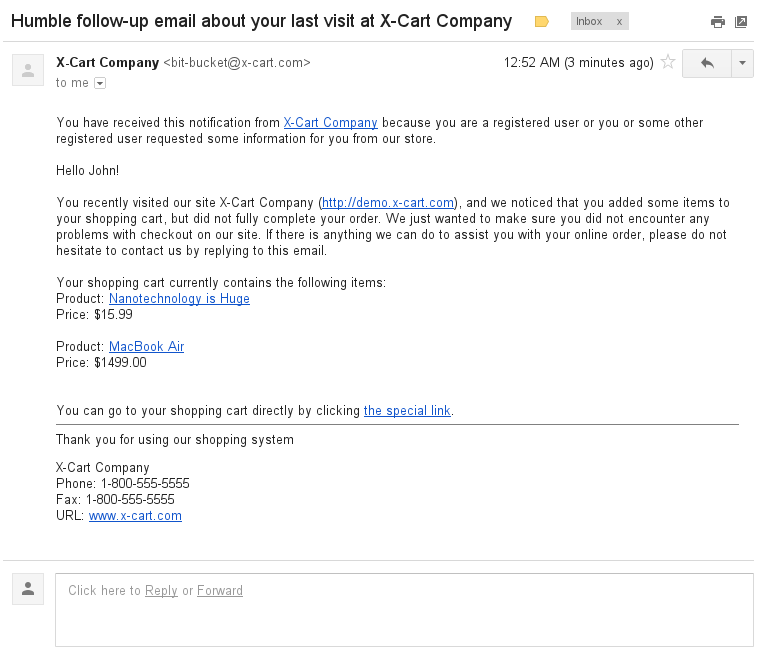 Abandoned Cart Reminder helps you recapture at least a portion of those sales that would otherwise be lost by automatically emailing one or more reminders to customers who log off before completing the checkout process. Stop sales from slipping through your fingers with Abandoned Cart Reminder, which automatically emails registered and anonymous customers to remind them of items pending in their shopping carts module. 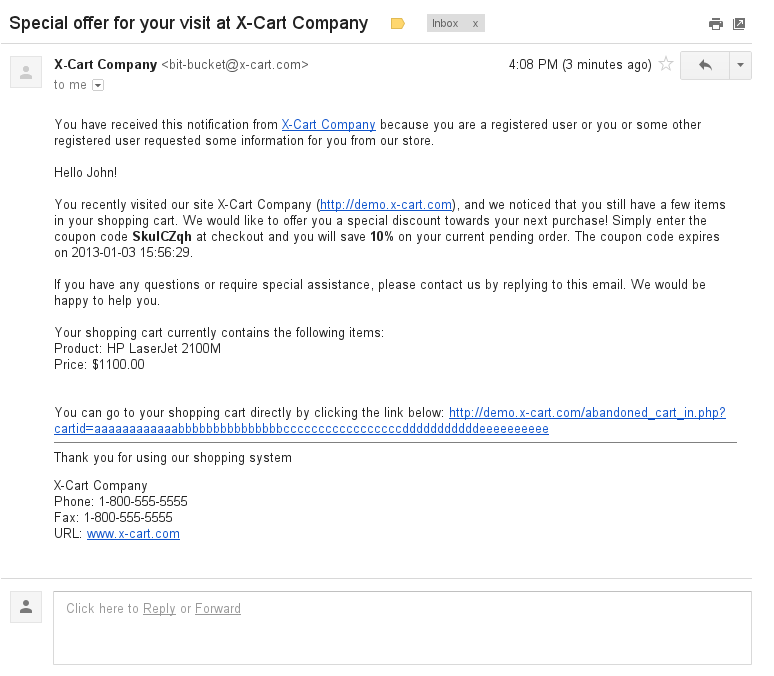 You can even attach discount and free shipping offers to further boost your conversion rates — and revenue! Simply configure your preferences and the module will flick through the abandoned carts regularly and send email notifications automatically. Search, update and remove abandoned carts manually, anytime. Customers can recover the entire contents of their shopping cart with a single click; no need to add items to the bag from scratch. It even retains selected product options and variants. Make your customer service team’s lives a little easier by enabling them to recover a customer’s cart with just one click and finalize an order manually. Further improve the odds of recapturing that sale by adding discount or free shipping offers good towards the shopper’s next purchase. Choose the time period between abandonment and the reminder email and specify the frequency and number of reminders you want to send. Works with registered and anonymous customers. Automatically logs-in registered customers and automatically populates address information for anonymous customers. 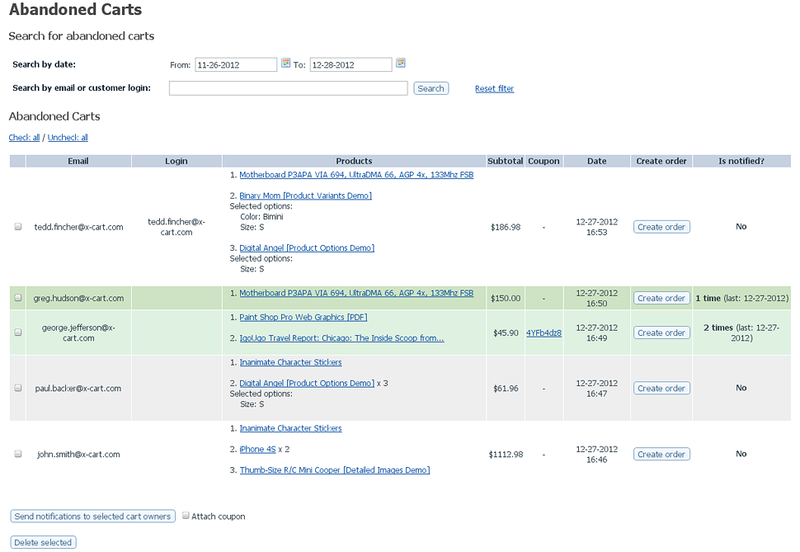 See for yourself just how much revenue you recover with Abandoned Cart Reminder. Looking for Abandoned Cart Reminder for Pro/Platinum? Please contact us.